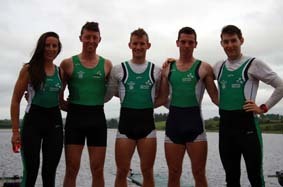 Skibbereen has 5 athletes Representing Ireland at the World Cup Regatta in Lucerne Switzerland. This is the 3rd and final World Cup regatta of 2015 and it will be the final test for crews before the World Championship and Olympic qualifier regatta to be held in France in early September. Skibbereen representation for Ireland is being led by U.C.D Scholarship student 21 year old Paul O’ Donovan who rows with his brother Gary O’ Donovan in the men’s Lightweight double scull. This category is one of the most competitive boat classes in the World Cup Regatta series with all athletes weighing an average of 70 kg; it makes for very tight competition with races often being decided by a photo finish. Even getting into the semi final is a major challenge in itself. Paul and Gary are no strangers to top class competition having recently finished 5th in the final of the European Championships in this boat class and Paul finished 4th in the men’s Lightweight single scull at last years World Championship Regatta in Amsterdam. Paul has rarely finished outside the top 4 in any major international event over the last few years. Having said that whatever happens this weekend the Skibbereen men are looking beyond Lucerne Regatta and have their sights firmly set on the world championships later in the summer where the top 11 boats will qualify for the Olympics in Rio in the lightweight men’s double scull. The men’s lightweight pair of Mark O’ Donovan and Shane O’ Driscoll are racing in this boat class for the first time and are looking forward to the challenge. The Skibbereen men only recently moved into the pair and are proud to represent their Country at the highest level in this event. They will be keen to make their mark. It will also be a big test for them as regards the World Championships later in the year. Denise Walsh is competing in the women’s Lightweight single Scull, a very competitive event with a maximum weight of 59kg for each athlete. Denise will be anxious to make her mark in this boat category having previously been an A finalist at the World Under 23 rowing Championships in this event. The Irish National Rowing Championships also take place at the National Rowing Centre on Inisscarra lake Farran Wood next weekend. While the athletes on International duty will put a serious dent on Skibbereen rowing clubs representation at the National Championships it will by no means affect the spirit and enthusiasm of the squad of 36 athletes who will strive to add to the 146 national titles the club has won since 1975. Skibbereen Rowing Clubs success at national level has been one of the main instigators of the clubs over all success since the foundation of the club 45 years ago. In particular the honour of becoming a National Champion in ones chosen sport has been one of the main catalysts of a very high level of Irish National team representation by the clubs athletes. This years Skibbereen team is being led by 34-year-old Kenneth McCarthy on the men’s side who is seeking his 16th National Title a fantastic record in itself. Kenneth is a former Irish International and will use his vast experience to help the squad achieve the best possible results. brings great confidence to the younger athletes many of who will be serious contenders for national honours. The men will contest 10 National Championships in boat classes that include the eight, four, double, pair and single. The women will contest 11 National Championships in the eight, four, quad scull, double scull, pair and single events. Also the possibility of winning more National Championships than any other club in Ireland is getting glaringly close (just 4 away) and whether it happens this year or not it will be a huge milestone in the clubs history and indeed will be another spur to drive the athletes on. Nuala Lupton the current club president won the first National Title for Skibbereen Rowing Club in 1975. Skibbereen Rowing Club has achieved more National Championships (146) in its short 45-year history than any other club in Ireland bar one. No other club has come close in that timeframe? Surpassing Clubs with rowing traditions going back centuries, including all the universities makes Skibbereen Rowing Club unique in rowing history.